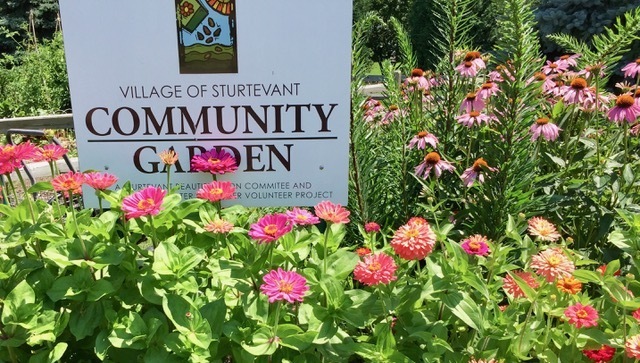 Sturtevant Beautification Committee is an ad hoc committee of the Village Board which began in 2003. In 2010, our committee was approved as a UW-Extension Master Gardener Project. We currently have 10 Master Gardeners on our committee, available to provide horticulture education on a variety of topics from choosing and planting flowers and vegetables to identification of invasive plants and native trees and plants. We plant and maintain many village flower beds and fill the beautiful planters located in front of various businesses along Durand and Wisconsin avenues. The community vegetable garden plots were built and are managed by our committee. We write an article of interest on a horticulture topic that appears each month on the village website. SBC volunteers donate an average of 100+ hours to the Village of Sturtevant each year. We welcome village residents to our committee. Anyone interested, please contact Rose at 262/994-4463 or Linda at 262/412-5578.